There are many reasons you might need to rent a dumpster, but unless you own a construction company you most likely won’t know what size dumpster to get. More important unless you are very familiar with dumpsters in general, you won’t have any idea of how much the material waste will weigh. Your total dumpster waste weight will be dependent on the materials that you are using on an given project. Materials weight varies, from roofing shingles, home siding, brush removal, home renovation materials and/or flooring – each material will provide you with a different total dumpster waste weight. 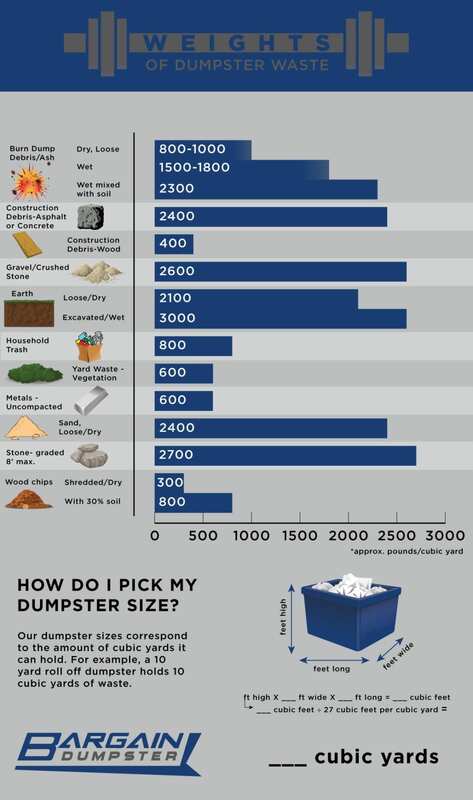 Roll-off dumpsters are measured by how many cubic yards of waste they can hold. Generally speaking the options are 10 yards, 20 yards, 30 yards, and 40 yards. Still not sure of what size Dumpster you will need? You can also ask the sales staff at Bargain Dumpster. They’ve worked with clients for every project type and they know what will fit in each size dumpster. Always be sure to tell the staff at Bargain Dumpster what you plan to put in your dumpster. This will not only help them give you an accurate recommendation, it will also mean you’re not surprised by any restrictions.